Never have I ever seen a caterpillar metamorphose into a butterfly except through some very specific steps. Before we can have a butterfly, there must be 4 distinct stages: egg, larva, pupa then adult. Each phase has different and necessary purposes. There is no way for the butterfly to skip a step, nor to take the steps out of order. People are the same regarding physical things. First gestation, childhood, teen then adulthood. Did you know that there are steps and order for spiritual things, namely, Salvation? God instructs us to look at nature because it shows His handiwork and it can teach us some spiritual lessons. [cr. Rom 1:20; Pslm 19:1; Prov 6:6]. The example of stages in nature can teach us very powerful lessons about the stages of Salvation. Although the modern religious world rejects any plan of salvation that has man doing anything, this doesn’t negate scripture that says there is a part man must do and, in God ordained order. “And he trembling and astonished said, Lord, what wilt thou have me to do? 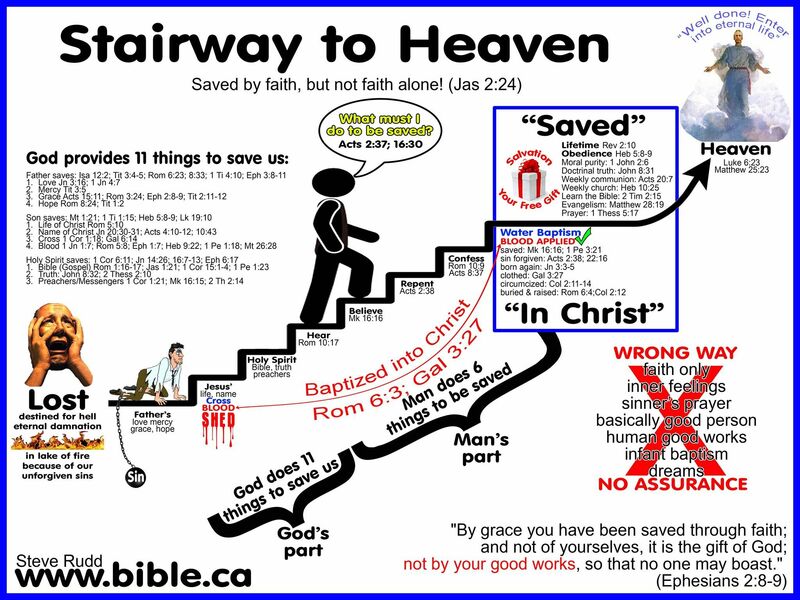 And the Lord said unto him, Arise, and go into the city, and it shall be told thee what thou must do.” [Acts 9:6] (emp seb) That being said, and proved, what are the steps for salvation and must they be completed in order? Romans 10 lays out that there is an order (steps) for one to follow. In verses 13-14, Paul shows that the beginning steps leading to salvation are HEARING, BELIEVING & CALLING ON THE NAME OF THE LORD. He goes onto write that faith cometh by hearing and hearing by the word of God. This shows that HEARING, BELIEVING & CALLING ON THE NAME OF THE LORD shall be learned through the study of the Word of God, namely, the New Testament. But, is this all that the New Testament has to say on this subject? CERTAINLY NOT! In the same chapter in verse 10 Paul wrote, “For with the heart man believeth unto righteousness; and with the mouth confession is made unto salvation.” (emp seb) So CONFESSION is also essential to salvation, but is this all that there is? A problem many folks have is that they stop at one passage without considering all that God has revealed about a subject. This is how & why we have thousands of denominations today. Let’s continue our search. Thus far we have learned that salvation begins with…HEARING the word of God through the scriptures, BELIEVING this word, CONFESSING and CALLING on the name of the Lord. (there must be a distinction between CONFESSION & CALLING). To answer this question we go back to where we began this article by noting what Paul (Saul of Tarsus) was told to do by Jesus. We refer to his own retelling of the story in Acts 22:16, “And now why tarriest thou? arise, and be baptized, and wash away thy sins, calling on the name of the Lord.” We learn that water BAPTISM is synonymous with “CALLING ON THE NAME OF THE LORD” and that it precedes salvation. Jesus said, “except ye repent, ye shall all likewise perish.” [Luke 13:3] Clearly, He’s speaking about salvation. After His death, burial & resurrection, but before His ascension He also said, “He that believeth and is baptized shall be saved; but he that believeth not shall be damned.” [Mark 16:16] (emp seb) This verse also shows the necessity of not skipping the steps and doing them in order and for their intended purpose. Failure to follow the steps in their proper order and for their intended purpose is to fight against the very will of God [Acts 5:39]. There is much more on this subject, but none of it contradicts what has been said thus far. Another thing we find is this saying, also from Jesus, “be thou faithful unto death, and I will give thee a crown of life.” [Rev 2:10b]. From this, along with passages like Mat 28:20; Acts 2:42; 2Tim 3:14-17, we learn that continued faithfulness is what those who have obeyed the gospel will continue to do. A person that is practicing faithfulness without having “obeyed the gospel” is practicing a vain religion. There are far too many people living in this false hope.